Purging your life of toxic people is a great move for you happiness. It could also be good for your waistline, especially if these Negative Nancys are the type to criticize your appearance. A study published in the social psychology journal Personal Relationships found that women who heard words of acceptance toward their bodies were more likely to stabilize or lose their weight. Those who were exposed to negative messages were more likely to gain. As New York Magazine's Melissa Dahl puts it, "Never underestimate the power of a kind word." 2. ...And the kind of people who have self control. Find the folks who accept your body for the way it looks in the present moment, and hold on to them tightly if they're the type to exert self-control when it comes to food. This second trait is contagious. Research suggests that diners can be influenced by both the gluttonous and controlled eating habits of their peers. If you're trying to lose a few pounds, ask that friend who loves going out for late-night French fry binges to join you in activities that don't include eating. Suggest a walk, a class or anything where neither of you will be tempted to surrender to a gorge fest. Seeing food on TV will make you want food in your belly. Research published in Health Psychology examined the effect food-based television advertisements had on viewers and concluded the impact was great: exposure to food advertisements caused people watching TV to snack more. The snackers were not necessarily driven to eat the product being promoted, but snack food in general. Similarly, watching cooking shows for recipe inspiration has been linked with a greater risk for obesity. Switch off the Paula Deen and DVR your favorite shows -- thereby gaining the power to fast forward through ads -- to defeat the power of the almighty hunger-inducing commercial. This is a simple one: Make a point to chew your food rather than slug it down. Chewing will make you eat your meal more slowly, which research shows will make you ingest fewer calories. Taking time to chew your meal gives your body more time to register fullness, so you can stop when you feel "full" rather than when you're "stuffed." When in doubt, sleep. Sleep appears to be a miracle solution for ailments across the board: It can boost your mood, improve your performance at work and even hamper headaches. Extensive research has shown that people who sleep fewer hours are more likely to be overweight. When you're running on empty, you feel hungrier than you would with quality rest. No squats required. Instead of eating your food while standing over the kitchen counter, take a seat at the table. 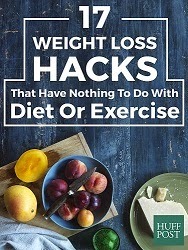 This tiny move will abate mindless eating, according to research published in the Journal of the Academy of Nutrition and Dietetics, because you're more likely to eat at a slower pace. 7. Eat some produce before food shopping. A recent study conducted by food psychologists at Cornell University found that eating something healthy before hitting up the grocery store makes shoppers less inclined to purchase junk food. If you chomp on a piece of fruit instead of a cookie before shopping, researchers say you'll be in a "healthier mindset" and more likely to make smarter food choices. 8. Eat off of a plate, not out of the bag. Seeing is believing, so it's important that you see how much of a snack you're ingesting before you dive in. Otherwise, you could consume way more than you intended. If you're truly devoted, you might divide a snack into individual portions even before you get munching (store the rest for later in sealable plastic bags). This'll help you stick to one serving. 9. Make that plate a blue plate. If blue doesn't fit in with your kitchen decor, fear not. This suggestion is based off of a series of studies that found when a food's color contrasted with the plate on which it was was served, fewer calories were consumed. Experts often recommend blue because not many foods are blue. In one experiment, researchers found that people ate more of a spaghetti and marinara sauce dish when it was served on a red plate, matching the sauce, than when it was served on a white one. The contrast, according to the scientists, makes the portion appear larger. To put this trick to work, just make sure your plate doesn't match the color of your dinner. 10. And a small plate. This one's all about visual deception: A smaller dish will make your portion look larger, which will trick you into thinking you're eating more. According the the Cornell Food and Brand Lab's Small Plate Movement, eating from a 10-inch plate instead of 12-inch one could help you eat 22 percent less of your meal. 11. And drink out of a tall, skinny glass. Cocktails may look fancy served on the rocks, but that short, wide glass may have provoked an over-pour of calories. 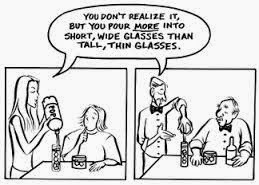 One study found that people pour 30 percent more liquid into short glasses compared to tall skinny ones of the same volume, overestimating how much they're really pouring. 12. Conceal your junk food. Out of sight, out of mind. If seeing food on TV induces cravings, it makes sense that not seeing food could help to reduce these effects. One experiment, with results published in the International Journal of Obesity, found that office workers ate fewer candies from a bowl when the bowl was opaque or covered, compared to when it was clear. You can implement this trick at home by putting your junk food in colored containers or placing it behind healthier options in the pantry. 13. And put your healthy food in plain sight. Organize your fridge like a mullet: Business in the front, party in the back. The office candy bowl study found that when food was more visible and accessible, people tended to eat more of it. This discovery can be used to a dieter's advantage by replacing the candy bowl with nutritious foods like fruit. In a separate study, researchers compared the consumption of apples and popcorn based on proximity, finding that people ate more of whichever offering was closer. 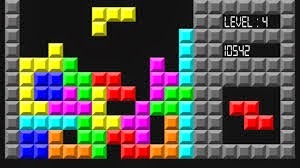 If you've got a food craving, treat yourself to a good old-fashioned game of Tetris rather than attempting to "wait it out." A 2014 study revealed that visual-based tasks like playing a game decreases feelings of cravings (Angry Birds will probably work, too). Researchers say much of a craving is image-based, so distracting your mind with something else that is visual can minimize the strength of a craving. “Wearing stylish clothing that makes you feel attractive -- as opposed to comfy sweats and lounge wear that hide your body -- will encourage you to eat in a way that shows you care about your appearance and your body,” clinical psychologist Katie Rickel told Grandparents.com. Dressing the part can serve as a good reminder of your goals. Stop drinking soda forever. Even the diet versions. Sodas contribute to a host of health problems, including risk for obesity and diabetes. Swap your habitual soda for a glass of calorie-free, risk-free water and you'll be healthier (and possibly thinner) for it. 17. Take the proverbial chill pill. Chronic stress can be a major cause of weight gain, so it's in your best interest to relax a little. Pinpoint the root of your stress and address it: Consider talking your problems out with a friend or therapist, and be proactive about mitigating it. You might consider participating in some stress-reducing activities: Deep-breathing, yoga, listening to music and taking a nap have all been shown to help calm nerves.